When you configure a well item in Insight, you can perform various tasks on the well components (paths, checkshots, markers and log curve sets). These tasks include taking/relinquishing ownership of a well component, deleting a well component from the project database and activating a well component. 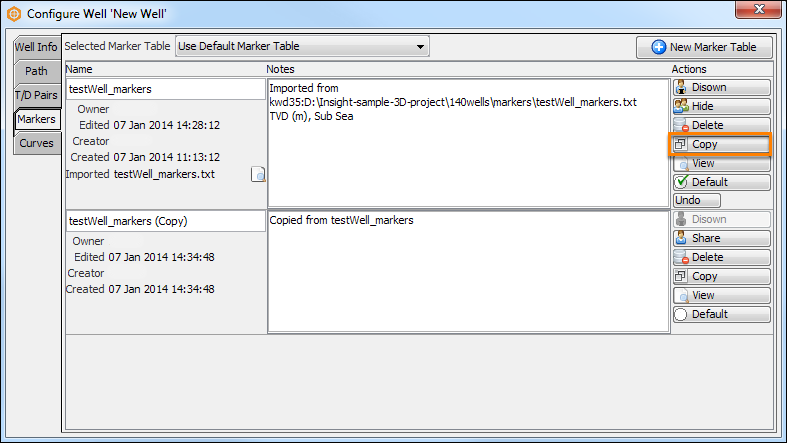 The following examples are based on managing a marker file. Before you can edit a well component, you need to take ownership of it. In the example above, you should take ownership of a marker file before you can edit the markers of a well. When you first add a well component in Insight and subsequently save the current session, you will be the owner of the component. However, once you have taken ownership of a well component, you can choose to relinquish it. This allows other users to take ownership of the well component and edit it. 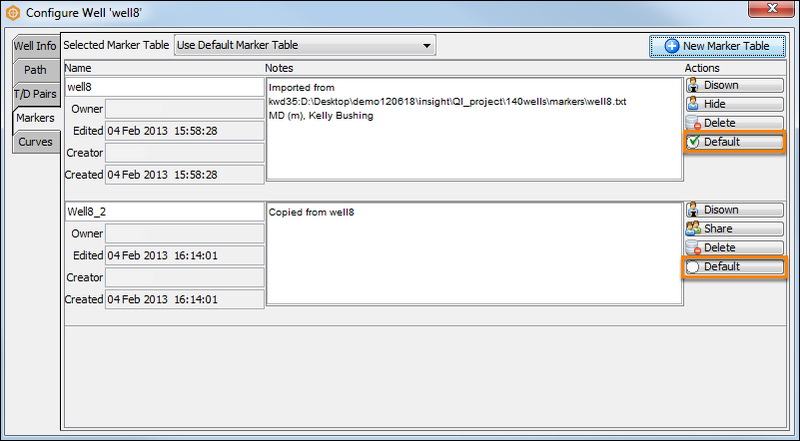 Under the Actions column, click Own to take ownership of the marker file. In the Unmodifiable Marker Set window, click Take Ownership. If you are the current owner of the marker file and wish to relinquish the ownership, click Disown under the Actions column. Save the session to save the ownership change of the well component. Tip: The current owner of the well component is displayed at Owner in the Configure Well window. Once you have taken ownership of the well component, you can choose to Hide or Share it with other users. If you choose to hide it, other users will not be able to see it in their list. You can delete a well component from the project database. In the Well tab, double-click a selected well to open the Configure Well window. Click Yes to delete the well component from the project database. You can also copy a well component to duplicate the original. Under the Actions column, click Copy. The copied component will be added after the original with the word "(Copy)" to denote the duplicate version. You can change the name of the duplicate component by clicking in the Name field and giving it a new name. The new component will automatically be saved when you save the session. To manually save the new component, right click on the Well in the Control Panel and select Export 'Component'. You can load multiple files for each well component type. However, for well paths, checkshots and markers, you can only activate one component file to be used for the well (see Selecting Default Well Components). As for log curve sets, you can activate multiple LAS files to be used for the well (see Using Multiple LAS Files). To select the active component, select the Default button or click the Selected circle in the Actions column. You can undo a change that you have just made in a well component by clicking Undo in the Actions column. Once you have undone the change, it is possible to revert to the change you have made by clicking Redo.